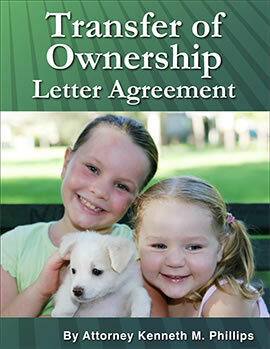 This Transfer of Ownership can protect yourself from getting sued after you give your dog away. It tells the other party that your dog has the potential to hurt someone, and confirms that you no longer will have ownership or liability for whatever the dog does. It also negates a number of things that could be used as evidence against you in case there are future problems with the dog. Don't leave to chance what might happen in the future. Signing the other party's document probably won't protect you in any way. Having nothing in writing certainly leaves you open to a future claim against you. This simple letter agreement will give you peace of mind!